RIVERTON — Flanked by dozens of family members, friends and neighbors in front of her Riverton home, Laurie Holt looked into television cameras and made a plea to the Venezuelan government to give her son adequate medical care. "Make sure he gets the help he needs," Holt urged. "I am pleading as a mom. Please don't let him lay there and just die." Josh Holt, 24, has been behind bars in Venezuela since June 30 after authorities contend he was stockpiling weapons in his new wife's apartment in Caracas. He is suffering from internal bleeding as well as pneumonia-like symptoms, his mother said. "He woke up this morning and there was blood everywhere," Laurie Holt said. Earlier in his jail stay, Josh Holt also suffered from scabies, kidney stones and a separate bout with either pneumonia or bronchitis, his family has reported. "The jail is not going to take him to the hospital even though it was recommended by a physician at least three or four times. I'm worried that Josh is going to die before we get him home," Laurie Holt said Wednesday. Josh Holt had recently married Theresa Caleno after the two met online and connected because of his desire to improve his Spanish skills. Caleno, who Venezuelan authorities say was an accomplice, is also currently jailed. Law enforcement in the area claims Josh Holt's case is tied to meddling by the U.S. in the South American country, which is currently steeped in political turmoil. Laurie Holt has previously said she believes an assault rifle and a grenade were planted in her son and daughter-in-law's apartment as false evidence. At a hearing on Sept. 15, a judge has the option of dismissing Josh Holt's case because of a lack of evidence, his mother said. His family believes it's possible he could be released from jail on that day with the understanding that the case against him remains ongoing. Jasone Holt also pleaded publicly on behalf of his son Wednesday. "Please don't let the stupid political (trouble) that's going on right now cost him his life," he said. Laurie Holt also aimed some of her request Wednesday specifically at Nicolás Maduro, the president of Venezuela. "I don't know if you have children, (but) imagine them being in a prison and not being able to get the medical care that they need when they're sick," she said. The Holt family is working with a lawyer in Venezuela, a pricey effort that has completely drained their GoFundMe donations, Laurie Holt said. "Our life is completely changed," she said. "It's hard for me to (even) go to the grocery store." Laurie Holt asked for earnest prayers for her son. A GoFundMe account also continues to accept contributions on his behalf. She also thanked the supporters who rallied around her family at their home Wednesday. Some of them held signs asking for Josh's release and chanted "bring Josh home." "These are amazing people, an amazing support system for me," Laurie Holt said, breaking into tears as she gestured around her yard. "They are fighting (Josh's) fight with me." Derek Holt, Josh's brother, said Wednesday that the imprisonment is taking a heavy toll on his family. "Our life isn't coming home and hanging out around the table anymore," he said. "The family can only take so much." American diplomats visited Josh Holt behind bars on Aug. 16. The State Department said last month it is intently monitoring his situation. Rep. Mia Love and Sen. Orrin Hatch, both R-Utah, also spoke out in August in favor of Josh Holt's release. At the time, Love said she planned to formally request that Secretary of State John Kerry demand Josh Holt's release. She also issued a statement Wednesday. 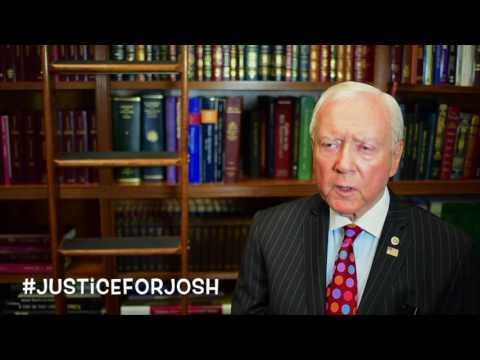 "I've been in touch with the State Department and brought the duty officer in Venezuela up to speed on Josh's situation and the need to get him immediate attention," Hatch said in a statement.